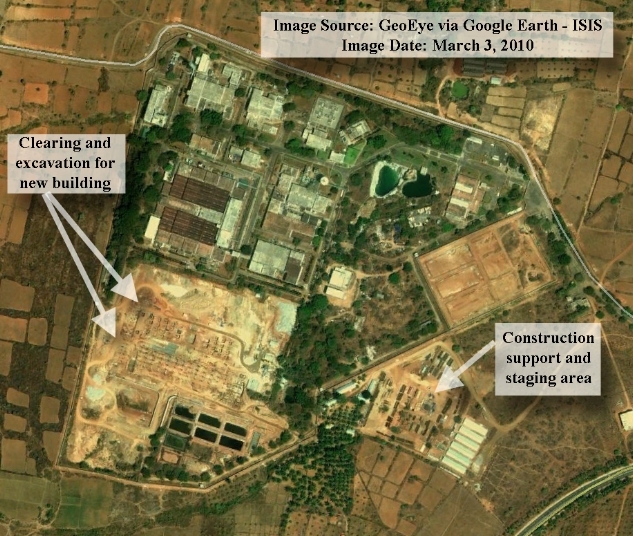 Google Earth recently posted new commercial satellite imagery covering India including the Rare Materials Plant (RMP), the site of India’s military gas centrifuge uranium enrichment facility (12.356,76.511). The new image from February 28, 2011 shows further progress in the construction of what could be a new gas centrifuge plant (see figure 1). Previously, ISIS identified the new construction in a satellite image, also available on Google Earth, dated March 3, 2010. The new facility under construction appears to be roughly 210 meters by 150 meters. Two cranes can be seen next to the construction (see figure 2). 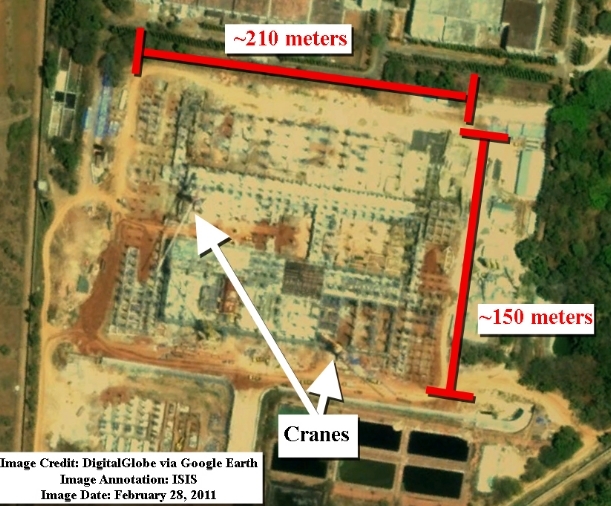 The satellite image from approximately a year earlier on March 3, 2010 shows mostly excavation work and site clearing for the new facility (see figure 3). 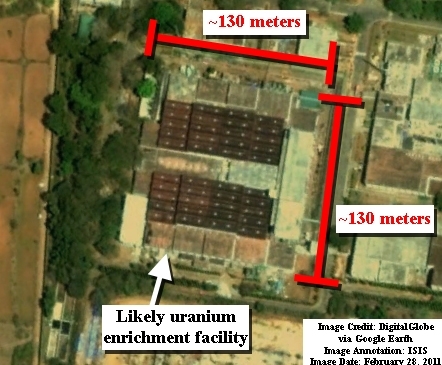 ISIS assesses that a facility adjacent to the new construction is likely the existing uranium enrichment facility (see figure 1 and figure 4). This enrichment facility is approximately 130 meters by 130 meters. The new facility under construction will be much larger than the existing gas centrifuge plant. 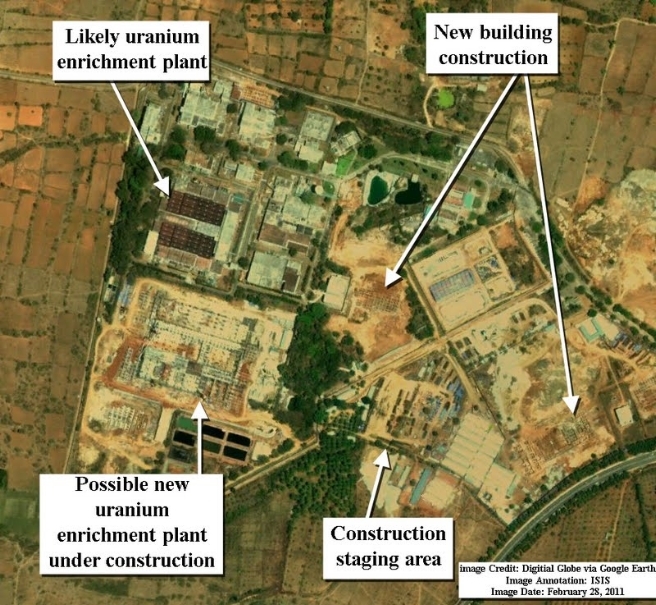 If the facility under construction is intended to be a new uranium enrichment plant, it may house a greater number of centrifuges giving India a larger enrichment capacity. Based on procurement evidence, ISIS assessed in 2006 that India would soon add at least 3,000 gas centrifuges to its enrichment program1 and that its uranium enrichment program would likely continue to expand. A new gas centrifuge plant would indicate that the military uranium enrichment program is indeed expanding and that further procurement activities are likely ongoing. Figure 1. February 28, 2011 commercial satellite image of India’s uranium enrichment site showing a new facility under construction, adjacent to what ISIS assesses is a gas centrifuge plant. The new facility under construction might be a new gas centrifuge uranium enrichment plant. Figure 2. Possible new gas centrifuge plant under construction. Close-up satellite image showing cranes around the construction site. Figure 3. Commercial satellite image from March 3, 2010, approximately a year before the newer image from February 28, 2011. Clearing and excavation for the new facility as well as a construction support site can be seen. Figure 4. A close up of what ISIS assesses is the existing gas centrifuge uranium enrichment plant at the site. At 130 meters by 130 meters, it is smaller than the new facility under construction at 210 meters by 150 meters (see figure 2).